Bonifacio Global City has an area of approximately 240 hectares, conveniently located in the forward looking city of Taguig, between the business hubs of Makati and Ortigas Center. It is also Manila’s gateway to the world, barely minutes from Ninoy Aquino International Airport. Here technology meets aesthetics. Transportation, communication, estate services and security are delivered reliably and seamlessly, leaving residents and visitors alike to do what they do best. Please see a video of Fort Bonifacio Global City from myts101 from YouTube. Fort Bonifacio (also Bonifacio Global City or The Global City) is a highly urbanized district in Taguig City, Metro Manila, Philippines. The district is named after the main Philippine Army camp in Metro Manila, Fort Andres Bonifacio. In the recent years, Fort Bonifacio district has experienced commercial growth through the sale of military land by the Bases Conversion Development Authority (BCDA). 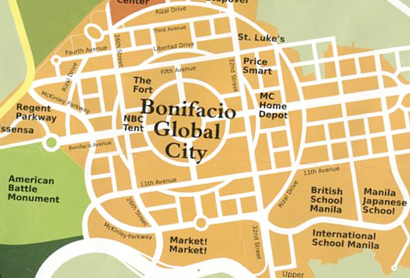 In 1995, Bonifacio Land Development Corporation start to plan a modern city — the Bonifacio Global City. BLDC made a successful bid to become BCDA’s partner in the development of Bonifacio Global City. Ayala Land, Inc. and Evergreen Holdings, Inc. of the Campos Group purchased a controlling stake in BLC from Metro Pacific in 2003. BCDA and the two companies now control Fort Bonifacio Development Corporation, which oversees the master planning of Bonifacio Global City. 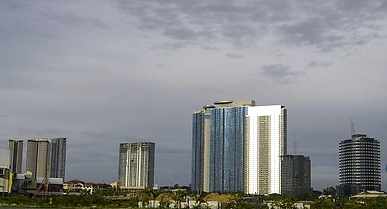 The Bonifacio Global City is now a rich district with a high number of skyscrapers, even if the city is still rising. Many skyscrapers are under construction and will be built in future. Fort Andres Bonifacio is the national headquarters of the Philippine Army (AFP) and is located in Makati City. It is located close to Col. Jesus A. Villamor Airbase, the national headquarters of the Philippine Air Force (AFP). 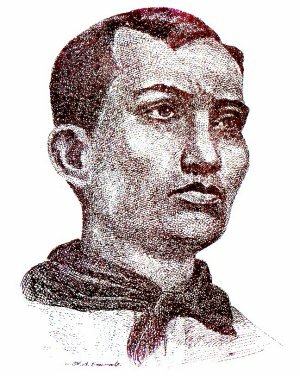 The camp is named after Andres Bonifacio, the revolutionary leader of the Katipunan. During the American colonial period, the US government acquired a 25.78 square kilometer property of Taguig for military purposes. This area (TCT dated 1902) was turned into a camp and was then known as Fort William McKinley after the 25th US President, William McKinley. After the Philippines gained its political independence from the United States on July 4, 1946, the US bestowed to the Republic of the Philippines all rights of possession, jurisdiction, supervision and control over the Philippine territory except the use of their military bases. On May 14, 1949, Fort McKinley was finally turned over to the Philippine government by virtue of US Embassy Note No. 0570. Under the AFP leadership of Gen. Alfonso Arellano, Fort McKinley was made the permanent headquarters of the Philippine Army in 1957 and was subsequently renamed Fort Bonifacio, after the Father of the Philippine Revolution against Spain, Andres Bonifacio, whose father, Santiago Bonifacio, was a native of makati city. In 1995, Bonifacio Land Development Corporation, a consortium led by Metro Pacific, made a successful bid to become BCDA’s partner in the development of Bonifacio Global City. Ayala Land, Inc. and Evergreen Holdings, Inc. of the Campos Group purchased a controlling stake in BLC from Metro Pacific in 2003. BCDA and the two companies now control Fort Bonifacio Development Corporation, which oversees the master planning of Bonifacio Global City. The Bonifacio Global City is now a rich district with a high number of skyscrapers, even if the city is still rising. Many skyscrapers are under construction and will be built in future. Bonifacio Global City is now home to upscale residential condominiums such as Essensa, Serendra, Pacific Plaza Towers, Bonifacio Ridge, and Regent Parkway and office buildings such as Net One and Bonifacio Technology Center. Most trendy restaurants, bars, clubs, and retail outlets are located in Bonifacio High Street, Serendra, The Fort Square and Fort Strip. Meanwhile, Bonifacio Stop-over and the Car Plaza cater to motorists. Global City is anchored by a major shopping center, Ayala Land’s Market! Market! and by 2011, SM City Taguig. Many corporations have acquired properties and some have committed to relocate their regional or national headquarters, among them are Accenture, The Hongkong and Shanghai Banking Corporation, Deutsche Bank, Lawson Software, Fujitsu, Hewlett-Packard, Ericsson, TetraPak, JPMorgan Chase and Safeway. Opened in late 2009, St. Luke’s Medical Center consists of a 16-storey hospital building with 600 patient beds and an 11-storey medical arts building with 374 doctor’s clinics and ten institutes, one each for heart, cancer, neurosciences, digestive and liver diseases, eye, orthopedics and sports medicine, pathology, pulmonary medicine, radiology, and pediatrics and child health. The hospital is now one of the most advanced in medical technology in the Philippines administered by a highly trained staff. Coliseum and Convention Center, to be built by Northshore Holdings, Inc. and the current Taguig City administration, will be located on a 35,000 square metre site adjacent to Market! Market!. The center will include a hotel, office building, serviced apartments, a shopping center and a food court. The Shangri-La Hotel Group in 2008 undertook the groundbreaking of Shangri-La at the Fort. Scheduled to open in 2014, Shangri-La at the Fort will be a 60-storey mixed-used landmark with 577 hotel guestrooms, 97 hotel residences and 96 luxury condominiums. It is situated along Fifth Avenue, and will be sharing the prime block with the new headquarters building and the unified bourse of the Philippine Stock Exchange which was completed in 2010. The Embassy of the Republic of Singapore moved from Ayala Avenue in Makati to its permanent location now near the Global City’s center in 2008. British School Manila, International School Manila, Manila Japanese School, and STI College, and MGC-New Life Christian Academy – Global City are all located in the University Parkway of Bonifacio Global City. Other educational institutions in the area include the Global City Innovative College, and the Every Nation Leadership Institute. The masterplan of Fort Bonifacio was recently updated to allow efficient traffic management and circulation. On September 9, 2008, Taguig City former mayor and currently Congressman Sigfrido Tiñga announced and claimed that the Fort and City will build the Federal Land Tower. It will have 66 floors with the total height of 250 m. When finished, its one of the tallest building in the Philippines. The P 20-billion tower is estimated to start construction by late 2008, by Federal Land, Inc. (led by its president Alfred Ty), on a 27-hectare North Bonifacio district lot (jointly owned by the Metrobank Group of Companies and the Bases Conversion Development Authority, BCDA). The first 25 floors of the skyscraper will be occupied by the Grand Hyatt Hotel (500 to 600 rooms), while the rest, by residential and commercial units. Forbeswood Heights is a residential development by Megaworld Corporation composed of six towers. Each residential tower is composed of 22 stories. There are 12 units in a floor composed of 1-bedroom and studio units which overlook a 5,500-square meter central park. McKinley Hill, a development project of Megaworld Corporation, is a 50 hectare mixed-use township of residential, office, institutional and retail centers catering to an international clientele. It is located east of Forbes Park and south of the Bonifacio Global City. One of the first institutions to locate its operations at McKinley Hill is the Embassy of the United Kingdom. 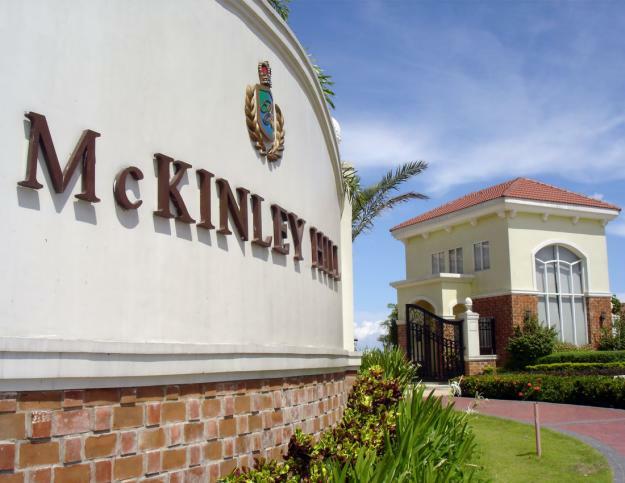 The embassy building sits on a 1.2 hectare U.K. Embassy-owned development in McKinley Hill. Since July 15, 2008, The Embassy of the United Kingdom has started operations in the said facility. The Korean Embassy has also relocated their facilities in McKinley Hill beside the U.K. Embassy recently. The newly opened Chinese International School Manila and Korean International School Philippines are located at Upper McKinley Road in McKinley Hill while Enderun Colleges, an international hotel school is at Park Avenue in McKinley Hill. The Venice Piazza at McKinley Hill is a mall located near the Chinese International School Manila. The mall had a soft opening on November 2009. It features a Grand Canal with gondola ride, inspired and patterned after the Venetian Hotel’s Grand Canal. Heritage Park was developed by BCDA. It is a 76-hectare high-value, multi-use memorial park designed with an ideal environment, beautiful landmarks and equipped with modern interment services, crematory and other facilities. The park opened in the first quarter of 2001. Heritage Park is located on Bayani Road in Fort Bonifacio. It is between Libingan ng mga Bayani and The Manila American Cemetery and Memorial. The Libingan ng mga Bayani (Tagalog: Cemetery of Heroes) is a memorial ground housing 33,520 Filipino soldiers killed in Bataan, Corregidor and other battlefields in World War II. Presidents of the Philippines, national artists and other honorable Filipinos are also buried here. The Vietnam War Memorial and Korean War Memorial are located in the Libingan ng mga Bayani. The Manila American Cemetery and Memorial is located on a prominent plateau within the limits of Fort Bonifacio. It contains the largest number of graves (17,206) of American soldiers who fought in World War II. Most of the soldiers buried at the American Cemetery lost their lives in operations in New Guinea and the Philippines. Taguig (formerly spelled as Tagig; Filipino: Lungsod ng Taguig) is a city in Metro Manila in the Philippines. From a thriving fishing community along the shores of Laguna de Bay, it is now an important residential, commercial and industrial center. The recent construction of the C-5 highway and the acquisition of the Fort Bonifacio development area has paved the way for the cityhood of the municipality. It is also accessed by the future C-6 Road. Taguig City is home to several prestigious international schools such as the British School Manila, International School Manila, and Manila Japanese School, which are all located in the University Parkway of Bonifacio Global City. The Chinese International School Manila, Enderun Colleges, and Korean International School Philippines are in the nearby area of McKinley Hill. Other schools in Fort Bonifacio are the Global City Innovative College, Everest Academy Manila (the only Catholic-run international school in the Philippines), Victory Leadership Institute, and MGC-New Life Christian Academy. Two of the top state universities are also in Taguig City—the Polytechnic University of the Philippines, and the Technological University of the Philippines. Both universities are located in Bicutan, Taguig City. The Technical Education and Skills Development Authority (TESDA) was established through the enactment of “Technical Education and Skills Development Act of 1994”, which was signed into law by President Fidel V. Ramos. This Act aims to encourage the full participation of and mobilize the industry, labor, local government units, and technical-vocational institutions in the skills development of the country’s human resource. The TESDA complex and facilities are located at the East Service Road of the South Luzon Expressway in Taguig City. Taguig City has two Islamic educational institutions located in Maharlika Village—the Maharlika Bandara-Inged Integrated School and the Maharlika Village Islamic Madrasah. Other notable schools in Taguig City are the city-run Taguig Science High School in Hagonoy, the Catholic Church-owned Colegio de Sta. Ana (formerly Sta. Ana Parochial School), The Fisher Valley College, a Christian school in Hagonoy, and Saint Francis of Assisi College System, a Catholic school in Bagumbayan. The Taguig City University started their operations in November 2006 with night classes at two of the city’s larger secondary schools. Construction of a school building will follow soon at a lot beside Taguig City Hall of Justice in Lower Bicutan. It is now the largest public college in the area. In the auditorium of TCU (Taguig City University) there is the city’s musical Kilos Kabataan. Food Terminal, Inc. (FTI) – the business center that boasts of over 300 medium scale companies in food manufacturing, electronics, garments and service industries. Camp Bagong Diwa – The camp is in Lower Bicutan, it is where NCRPO headquarters, prison complex and drug rehabilitation centers are located. Department of Science and Technology – A mini forest and eco-tourism park in Bicutan suitable for camping and bivouac activity. It is the national headquarters of the DOST. Veterans’ Museum – A museum where war stories in life-sized tableaus are retold using all forms of art fused with high-end technology. The Blue Mosque – A religious center and a socio-civic rendezvous for both Filipino and foreign Muslims in Maharlika Village. Bantayog ng Bayani – A fitting tribute to the heroes of Taguig during World War I at Fort Bonifacio. Shrine of St. Anne – Built in 1587 in Sta. Ana, one of the Philippines’ oldest churches. Dambanang Kawayan – A century old church in Tipas made of pure, native bamboo. It was inaugurated as a parish in 1969, comprising barangays Ligid-Tipas, Ibayo-Tipas, Calzada, and Palingon. Museo de Sta. Ana – A museum at the Shrine of St. Anne. The repository of artifacts detailing the rich religious culture and history of Taguig since 1857. Back to homepage. For more information about Park West, please see Inquiry. Certain images are obtained from the internet and are property of respective owner, if you are the owner of any image and do not want it to appear on this website, please contact me and it will be removed. Metrobank is registered trademark of Metrobank Inc.